Combine a day next to the water with watching top athletes rowing furiously. Rowing provides a very special treat as an enjoyable traditional British day out, with a twist. Become captivated by the gripping rowing races whilst soaking up the atmosphere, having arrived refreshed in a helicopter, collected from a location of your choice. Watch in admiration as the athletes compete on the river and witness the power, speed, determination and strategies applied by the rowers. The Royal Regatta is certainly one of the best known rowing races to date, and it’s popularity brings thousands of people to the River Thames over five days of spectacular races. These head-to-head races differ from ordinary rowing races, with only two boats competing per race. Nevertheless, this exciting, sophisticated event is full of thrills. See crews of new competitors and olympic heros glide through the water, as the sun blazes down on the water of the Thames. Because this event is, unsurprisingly, popular, traffic and queues can be major problems. Don’t let this spoil your day, fly to Henley with Atlas Helicopters and arrive at Henley’s own heli-pad, just minutes from the river, where the action takes place. Relax on the day and enjoy the unique mixture of English society and a jug of Pimm’s on the banks of the River Thames, without needing to worry about how much you are drinking or having to leave early to “beat the traffic”. 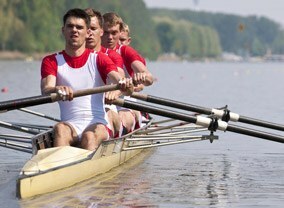 Travel problems will be a distant memory on the day as you enjoy the rowing races. Revel in the excitement of the racing schedule and enjoy the picturesque surroundings, the perfect setting for this popular and unique rowing event. Currently, Henley Regatta runs over 5 days each summer, with qualifying races the week before to offer 100 world-class races during the actual regatta, with Olympic stars often in attendance. See at first hand, how England consistently finds and develops Olympic sporting heroes, such as Sir Steve Redgrave, for the rowing events at the Olympics. Watch teams competing from all corners of the globe, and cheer on your favourites. With so much going on it is easy to see why this is one of the highlights of England’s social calendar. 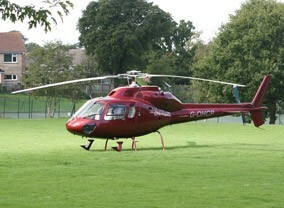 To book your helicopter to take you to the Henley Regatta in style please call our team now on 01256 635000 to reserve your flight. This is a popular event so demand is always heavy. Combine spending the day next to the water, sipping a cool drink and watching top athletes race on the water, rowing furiously to be the first home, with a flight in a helicopter and you have the perfect mix of excitement, sport and a social event. Easy and flexible travel means you will be whisked away by helicopter to your favourite rowing event, flying over the traffic knowing your plans will not be interrupted by transportation problems, as travelling by helicopter means all details have been attended to. Fly to a variety of venues, including the world famous Henley Royal Regatta, to watch competitors taking part in nail-biting rowing events. Avoid the stress of organising connecting trains, delays or sitting in traffic jams, missing the start of the day.